More than 1/3 of people in the world rely on fish as their major source of protein, however, global fisheries today face enormous challenges such as; overfishing, habitat loss, marine pollution and climate change. Fortunately, well-designed fisheries regulations can help mitigate these problems and ensure sustainability of fisheries into the future. 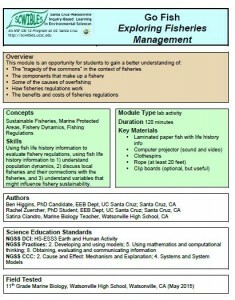 Teaching students about fisheries can lead to a public that is informed regarding fisheries management, and a generation of conscious seafood consumers. 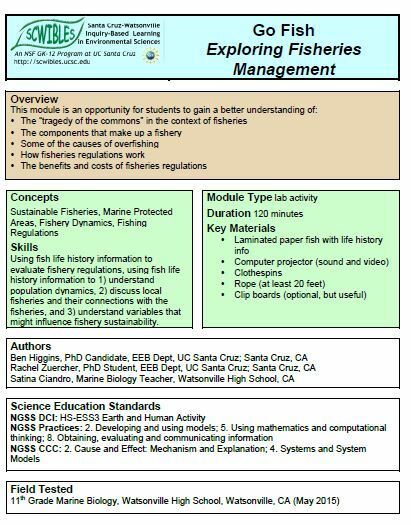 This module is an opportunity for students to learn: 1) The “tragedy of the commons” in the context of fisheries, 2) The components that make up a fishery, 3) Some of the causes of overfishing, 4) How fisheries regulations work, and 5) The benefits and costs of fisheries regulations. Gender is a relevant and contentious topic that is constantly reinforced through non-verbal queues in the media. LGBTQA (lesbian, gay, bisexual, transgender, queer, and questioning) issues are hotly debated in schools, courts, and public media venues. While most people think of gender as a simple binary (i.e. man or woman), gender is a complex and delicate continuum that includes many aspects that are not often discussed. 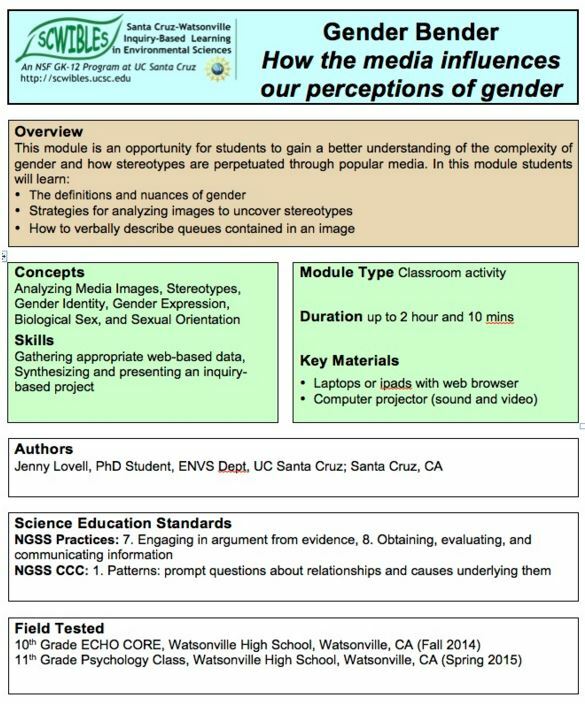 In this module, students will gain a better understanding of the complexity of gender and how stereotypes are perpetuated through popular media. 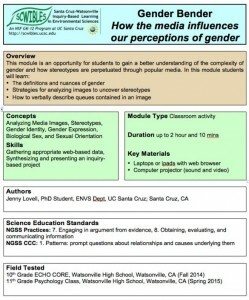 By the end of the lesson students will learn: 1) The definitions and nuances of gender, 2) Strategies for analyzing images to uncover stereotypes and 3) How to verbally describe non-verbal queues contained in an image. 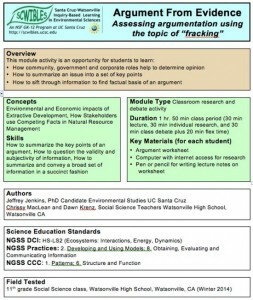 Students living in rural communities impacted by ongoing and proposed extractive mineral development (fossil fuels and mining) will gain a greater appreciation and understanding for how different segments of society (government, corporate, and community) produce information to serve their own interests and how ‘factual’ information is often contested between these groups. Students learn: 1) How to summarize the key points of an argument, 2) How to question the validity and subjectivity of information, and 3) How to summarize and convey a broad set of information in a succinct fashion. As described below in tne native plant garden module, one way to protect biodiversity is by restoring degraded habitats to more natural conditions. 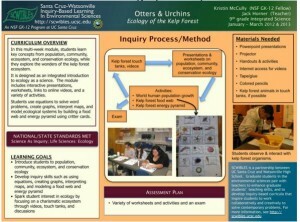 This process can be simulated at a school by creating a native plant garden. Native plant communities may also be studied in nearby protected areas. One way to expose students to local biodiversity and teach them the importance of biodiversity, is to learn about native plants and create native plant labels. 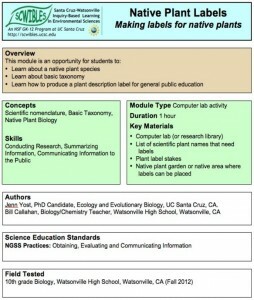 In this module, students research a native plant in their area and create their own native plant labels. These labels can be laminated and then attached to a stake that can be placed alongside the plant allowing others to identify and learn about local native plants. 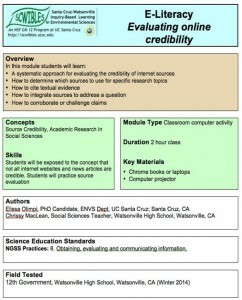 Students are faced with an overwhelming amount of information online and need to learn how to sift through available sources to find ones that are credible and appropriate for a specific research task. Many students have a basic understanding of the importance of evaluating sources, but have not practiced source evaluation. 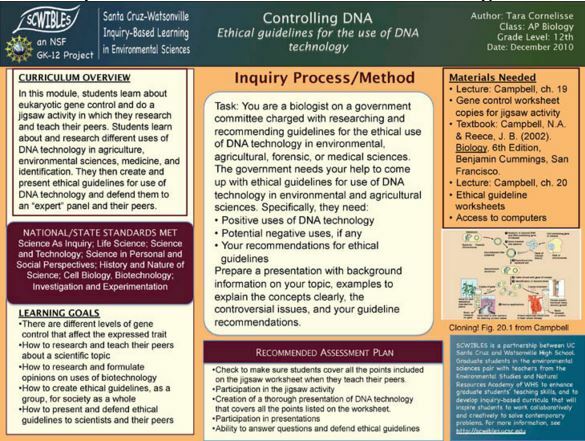 This lesson guides students through the process by highlighting questions that the student should ask of the source in order to decide if it is reliable. 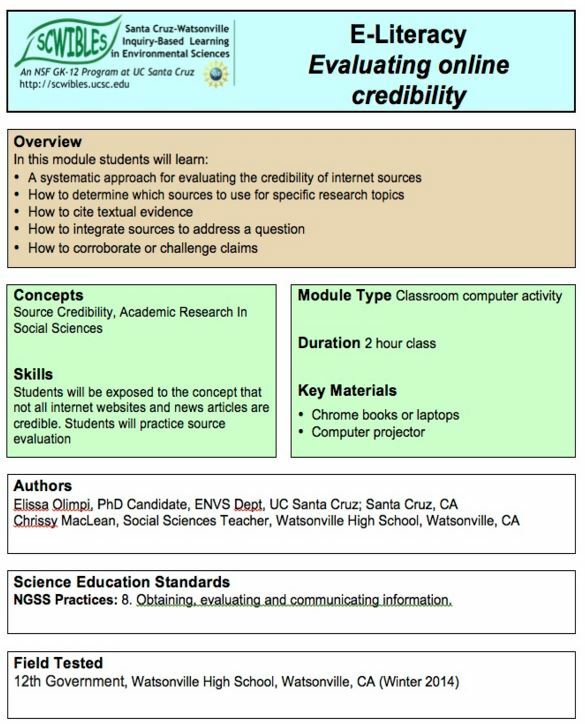 Students learn: 1) A systematic approach for evaluating the credibility of internet sources 2) How to determine which sources to use for specific tasks, 3) How to cite textual evidence, and 4) How to corroborate or challenge claims. 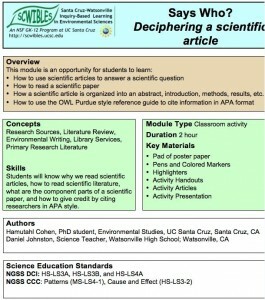 The goal of this module is to teach students how to read and understand scientific articles. 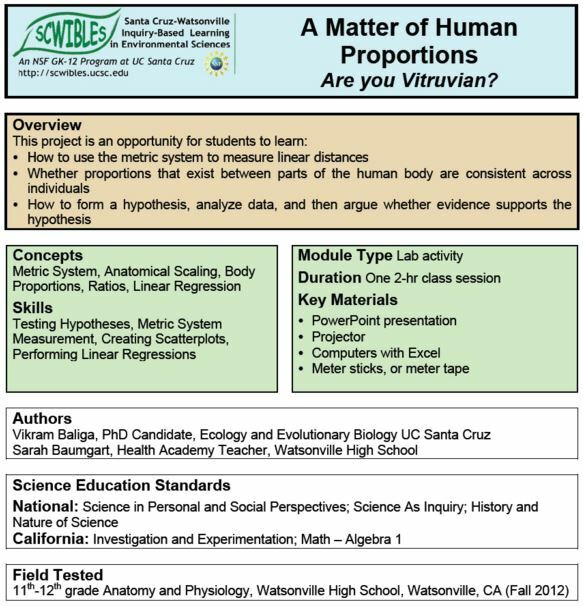 This skill can be applied to answering a variety of research questions from different disciplines of science and engineering. The context for this inquiry is the impact of climate change on a species. 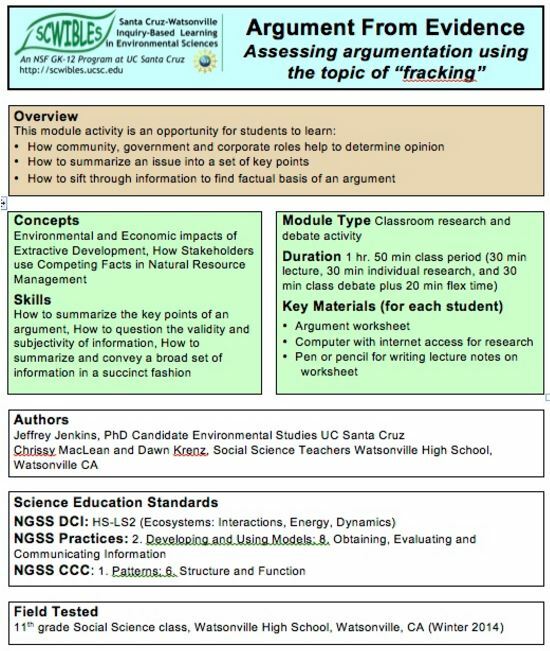 Although climate change is the specific prompt used here, the prompt can be modified for different classroom topics and different courses. Students learn: 1) How to read a scientific article, 2) How to use scientific articles to answer questions, and 3) How to cite information in APA format. 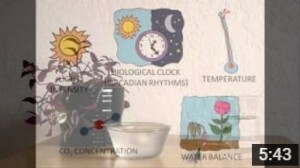 Many specialty fields use a variety of scientific techniques to answer questions and/or solve problems. For example, forensic scientists collect different pieces of evidence from a crime scene. 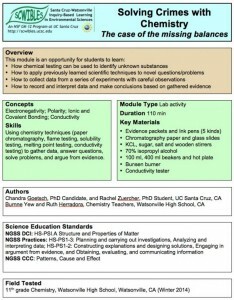 This module encourages students to choose which methods are appropriate to test the evidence. After conducting the appropriate chemical tests, the students conclude which suspect committed the crime. 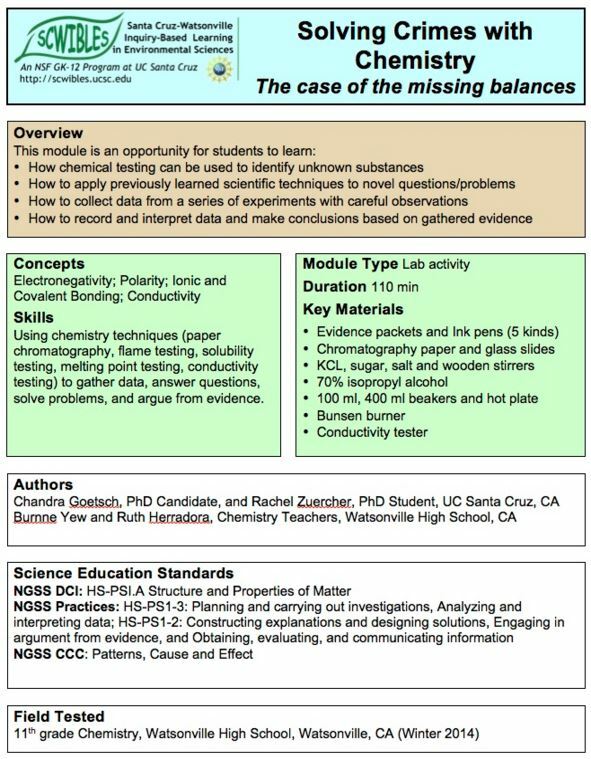 Students learn: 1) How chemical testing is used to identify unknown substances, 2) How to collect data from a series of experiments, and 3) How to record and interpret data and make conclusions based on gathered evidence. Environmental Justice (EJ) describes the trend of environmental impacts disproportionately affecting minority communities. 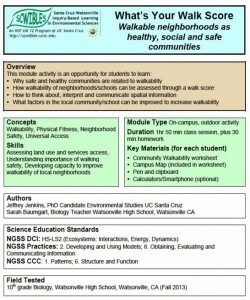 It is a great subject to get students engaged about their neighborhoods and health. The Toxics Movement is closely related to EJ and shares the common interest of all people having the right to a clean and healthy environment. Students learn: 1) How to look up public census data, 2) How to find toxic sites in their neighborhood, 3) How to formulate a testable question regarding census data and toxic sites, 4) How to synthesize data and draw conclusions that answer their questions, and 5) The key components of presenting a social science project to an audience. Marine mammals use sound for feeding, communication, predator avoidance, and navigation. 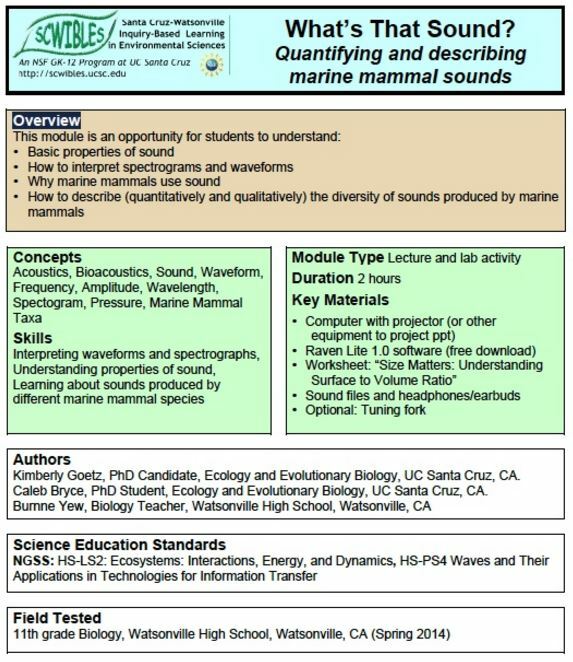 Students are introduced to the properties of sound by quantifying and describing sounds from several types of marine mammals (toothed whales, baleen whales, sea lions, and true seals). 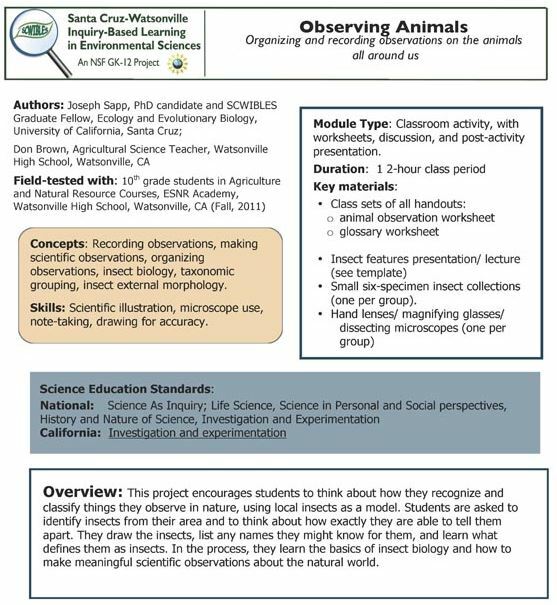 Students examine differences in sounds between marine mammal species and then use that knowledge to predict the source of a mystery sound. 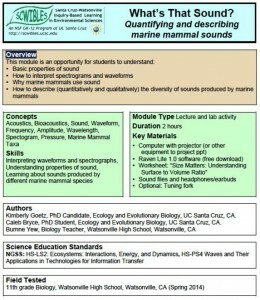 Students learn: 1) Basic properties of sound, 2) How to interpret spectograms and waveforms, 3) Why marine mammals use sound, and 4) How to describe the diversity of sounds made by marine mammals. 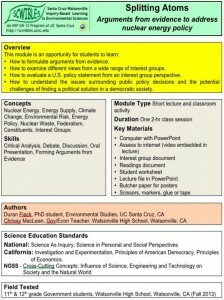 In this module students represent the views of an interest group that either supports or opposes the expansion of nuclear-generated energy in the U.S. Students learn about the source of energy within the U.S. with a focus on the potential benefits and risks associated with expansion of nuclear energy. In this module, students learn: How to formulate arguments from evidence, how to examine different views from a range of interest groups, how to evaluate a U.S. policy statement from an interest group perspective. Students will also learn how to understand the issues surrounding public policy decisions and the potential challenges of finding a political solution in a democratic society. 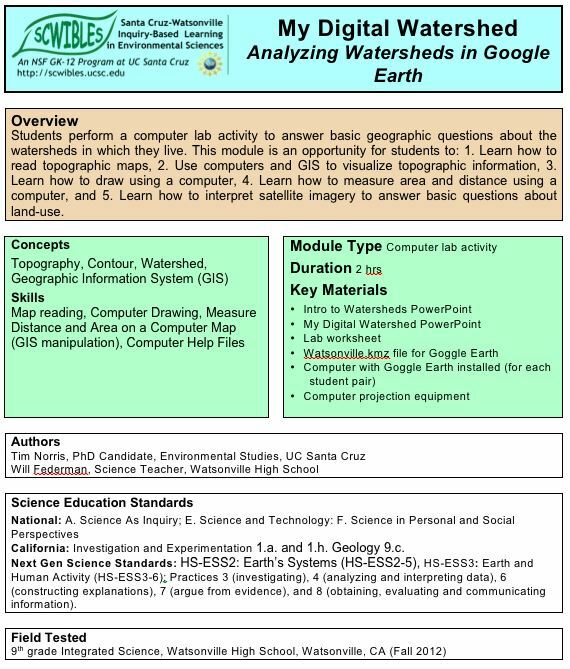 In this module students work in small groups with map-based data to learn about watersheds and to find a likely source of pollutants. After a short introduction, students work together to intrepret ther maps provided and to support an argument, stating where the pollutant is coming from, using the map data as evidence. The module provides all the supporting materials needed to run a 90 minute activity. 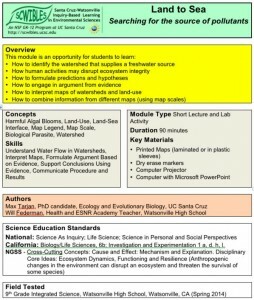 In this module, students learn: 1) How substances and organisms on land can affect ocean life, 2) How human activities may disrupt ecosystem integrity, to identify the watershed that supplies a river, 3) How to interpret maps of watersheds and land use, and 4) How to combine information from different maps using map scales, and 5) How to make estimates based on map data, and engage in argument from evidence. 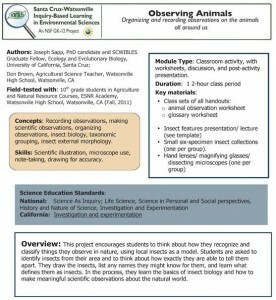 This module provides an opportunity for students to observe leaf stomata and make predictions about interactions between plants and environmental conditions. 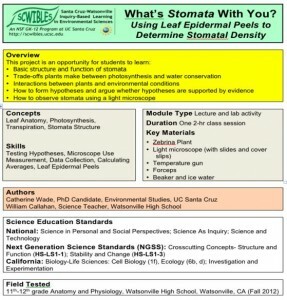 After introducing students to the basic form and function of stomata and discussing photosynthesis and transpiration, students will hypothesize about the distribution of stomata on the upper and lower leaf surfaces. Then, they make wet mount slides of leaf epidermal peels to view stomata under a microscope and calculate average stomatal densities for the top and bottom of the leaf. 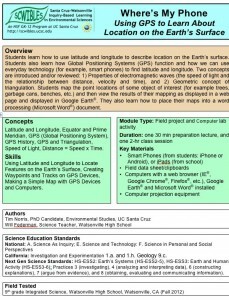 Students learn how to use latitude and longitude to describe location on the Earth’s surface. 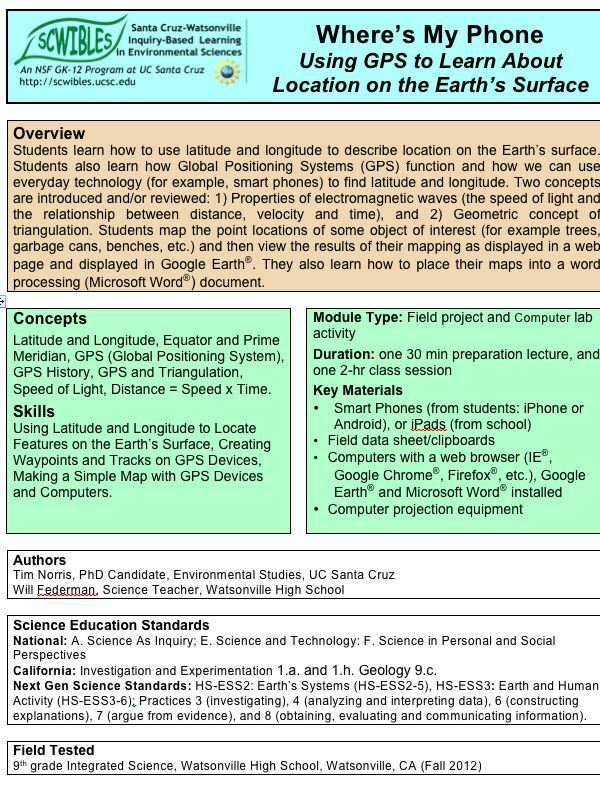 Students also learn how Global Positioning Systems (GPS) function and how we can use everyday technology (for example, smart phones) to find latitude and longitude. Two concepts are introduced: 1) Properties of electromagnetic waves (the speed of light and the relationship between distance, velocity and time), and 2) Geometric concept of triangulation. 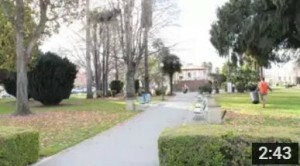 Students map the point locations of an object of interest (for example trees, benches, etc.) 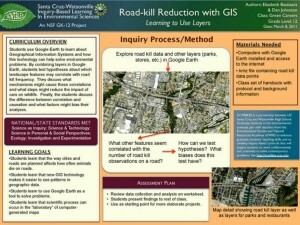 and then view the results of their mapping as displayed in a web page and in Google Earth®. They also learn how to place their maps into a word processing (Microsoft Word®) document. 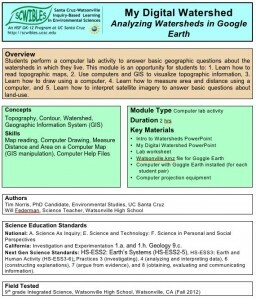 Students perform a computer lab activity to answer basic geographic questions about the watersheds in which they live. This module is an opportunity for students to: 1. Learn how to read topographic maps, 2. Use computers and GIS to visualize topographic information, 3. Learn how to draw using a computer, 4. Learn how to measure area and distance using a computer, and 5. Learn how to interpret satellite imagery to answer basic questions about land-use. 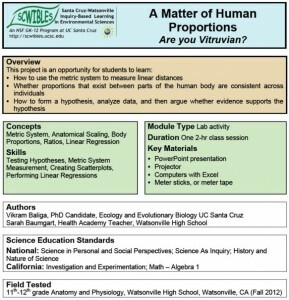 This module is an opportunity for students to learn: 1) How to use the metric system to measure linear distances; 2) Whether proportions that exist between parts of the human body are consistent across individuals; and 3) How to form a hypothesis, analyze data, and argue whether evidence supports the hypothesis. 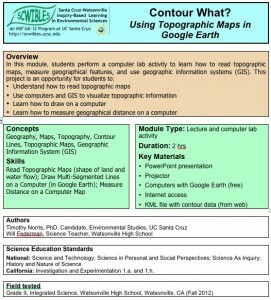 This modules is designed as an introduction to understanding topographic maps and GIS using Google Earth. 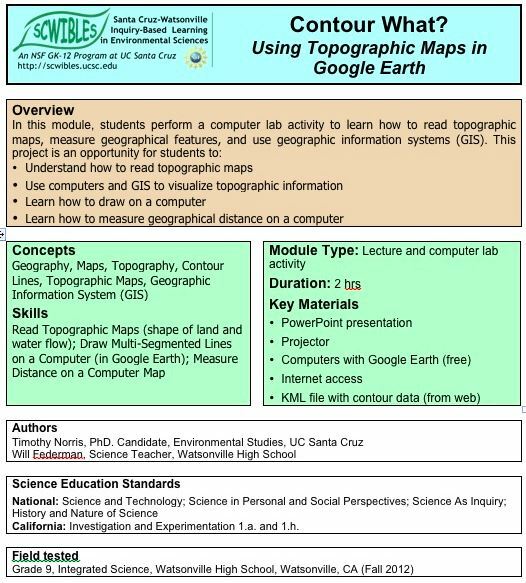 Students perform a computer lab activity to learn how to read topographic maps, measure geographical features, and use geographic information systems (GIS). 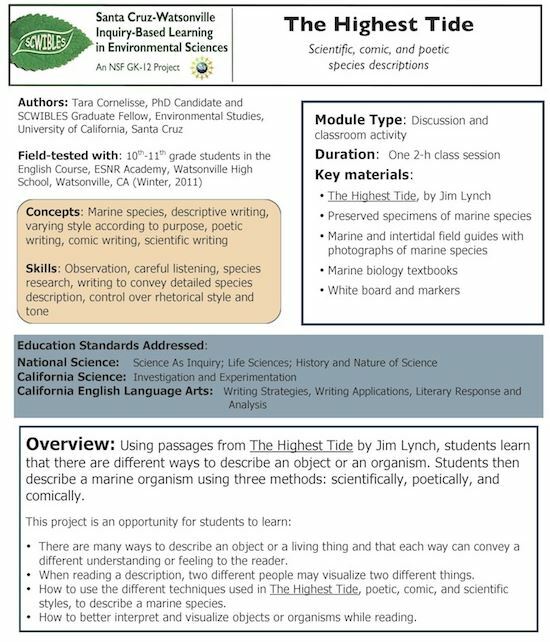 This multi-week modules is designed as a general introduction to ecology as a science, while exploring the excitement of the charismatic kelp forest ecosystem. 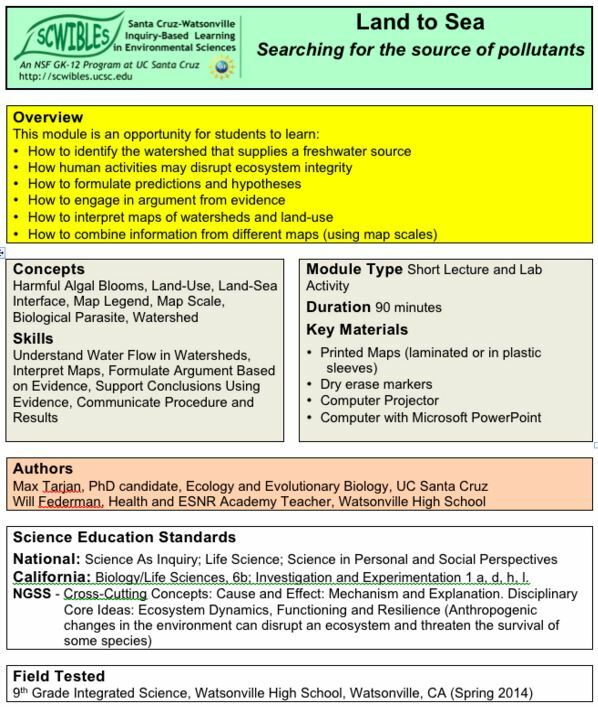 It introduces the fields of population, community, ecosystem, and conservation ecology, and helps build skills in using equations, creating graphs, interpreting maps, and modeling ecological systems. Students in low income communities are increasingly faced with poor nutrition and limited exercise options. One way to combat this is to teach about walkable communities. Teaching about walkable communities will also get students to think about land use in their own neighborhood, will make them more aware of their surroundings, and will provide direction for improving their communities. 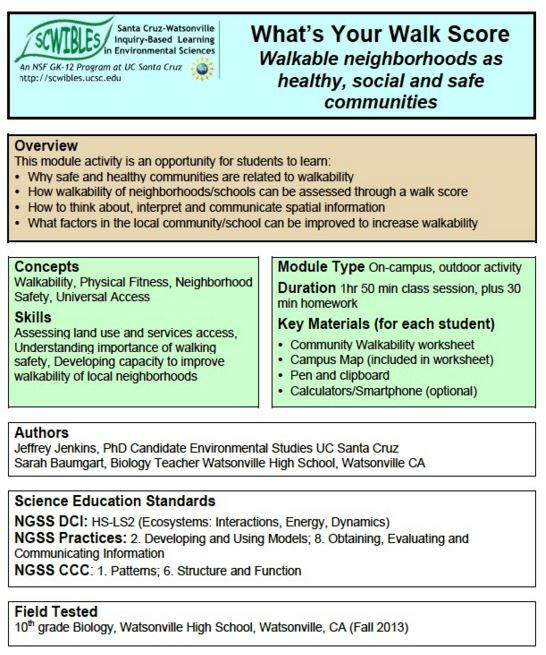 Students learn: 1) Why safe and healthy communities are related to walkability, 2) How walkability of neighborhoods/schools can be assessed through a walk score, 3) How to think about, interpret, and communicate spatial information, and 4) What factors in their community can be improved to increase walkability. 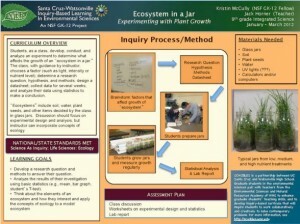 Students, as a class, develop, conduct, and analyze an experiment to determine what affects the growth of an “ecosystem in a jar.” “Ecosystems” include soil, water, plant seeds, and other items decided by the class in glass jars. 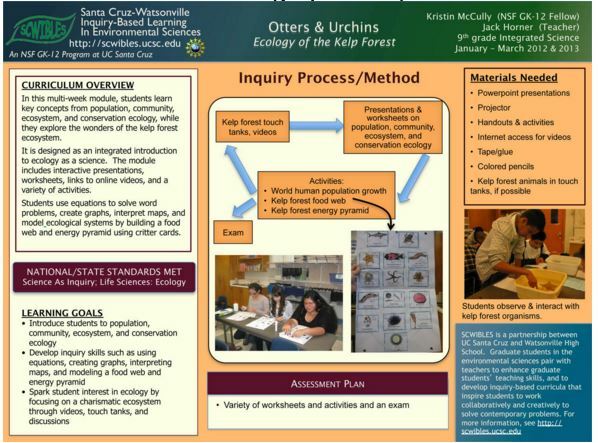 Discussion should focus on experimental design and analysis, but instructor can incorporate ecosystem ecology, biodiversity, food chains and webs, photosynthesis and respiration, and other concepts of ecology and biology. 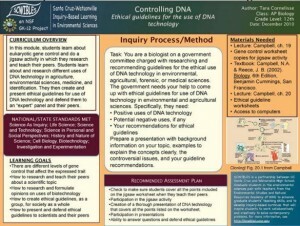 In four 2-hour class sessions, AP Biology students receive enriched, in-depth Power Point lectures that accompany their study of Campbell’s AP Biology textbook to explain the mechanics of DNA modification, and engage in two different group activities to apply their understandings of both science and social issues through engaged ethical reasoning, debate, and presentations. What factors influence roadkill densities on our streets and highways? What steps can we take to protect wildlife? 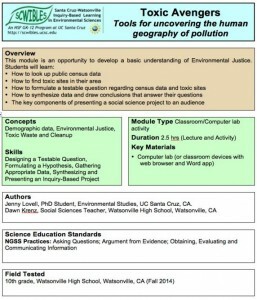 In this 2-hour module, students use Google Earth to learn how Geographical Information Systems (GIS) technology can help solve environmental problems. They also develop and test their own original hypotheses about roadkill, a familiar, local environmental issue. By combining multiple GIS layers in Google Earth, students develop and test hypotheses about which other landscape features may be correlated with roadkill frequency. Finally, the students discuss the difference between correlation and causation and what factors might bias their analyses. 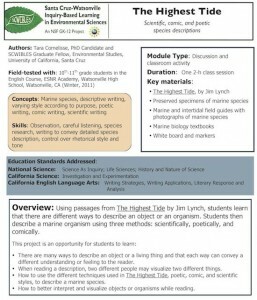 Using passages from The Highest Tide by Jim Lynch, students learn that there are different ways to describe an object or an organism, and that these may have different effects on readers, but all of them can include plenty of detailed information. Students first listen to several of Lynch’s most vivid and creative descriptions of marine organisms, and take turns in teams drawing those organisms as they visualize them, and attempting to categorize the descriptions as scientific, comic, or poetic–or as combinations–locating key words or phrases that convey humor, feeling, and extensive, factual information. Then they research and describe a marine specimen organism in detail three times, in response to three short prompts, which emphasize the three respective purposes: scientific, poetic, and comic.